As Suzett Whyte cuddled her newborn today, baby Sae’breon smiled and made a sound. “Him know him madda,” interjected a policeman at the Denham Town Police Station. 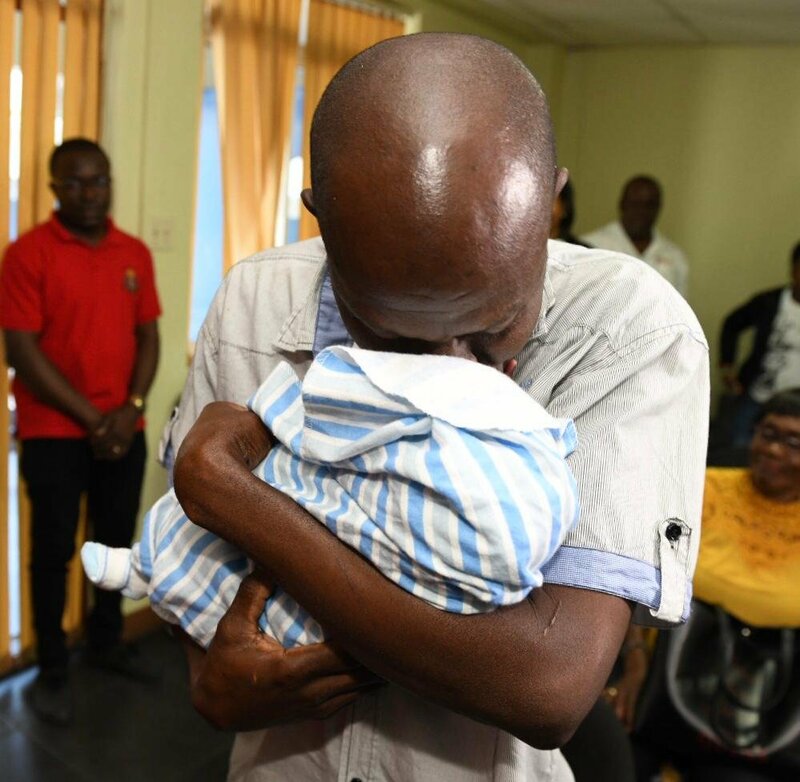 The comment would set off laughter among others who had gathered for the handing over of the baby to his parents, a month after he was snatched from Kingston’s Victoria Jubilee Hospital. The child was stolen on January 9 as Whyte went to the bathroom to freshen up. He was found at the Registrar General’s Department on Tuesday after an agent became suspicious when a woman turned up attempting to register the child. Whyte said during the month she was away from her baby, she often cried and had problems sleeping. She also admitted that she was angry, but said she now she has no ill feeling towards the suspect arrested for child stealing. “I don’t hate her, I forgive her,” said Whyte, but she still had an unanswered question. “As a woman, why would you take away somebody baby? ‘Cause me couldn’t do that to anyone,” Whyte said. But Whyte’s common law husband, Sinclair Hutton, would rather not see the suspect. “May the Father God have mercy pon har soul. The court will judge her. Mi just want to be at peace wid mi son,” Hutton said. Meanwhile, little Rudean Hutton was overjoyed as he looked at his baby brother for the first time. “I am so happy to have my brother back, I am going to play with him when I go home,” Rudean said. Baby Sae’breon had been in state care since he was found on Tuesday. On Thursday, the results of DNA tests conducted two days earlier confirmed that child belonged to the couple. Head of the Kingston Western police, Senior Superintendent Howard Chambers is discouraging people from abducting babies. He said people, unable to have children, should to go through the correct procedures to adopt a child.